I am on an Easter candy making kick. It is really quite fun, and of course you get to enjoy a delicious end product and maybe share it with others if it is good enough. I made some last night that was just that. Delicious. But not what you would expect. I love my hemp seeds, and recently made some hemp seed butter. I thought incorporating it into a candy would be awesome, so I could get my healthy fats, and enjoy my dessert too. So, I decided to go with the color. By color I mean the lovely green of the hemp seeds. 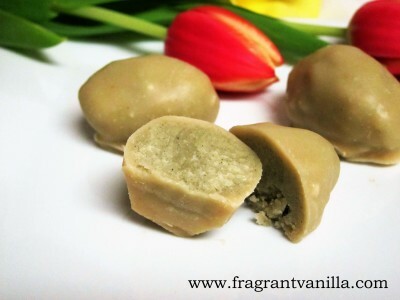 I added matcha to the hemp seed butter as well for the filling of this candy. Why not have some anti-oxidants with your healthy oils and dessert?! Ok, at this point, I know it sounds more savory than sweet. But don't you worry, I added cacao butter and vanilla and sweetened it up so that it tasted heavenly. 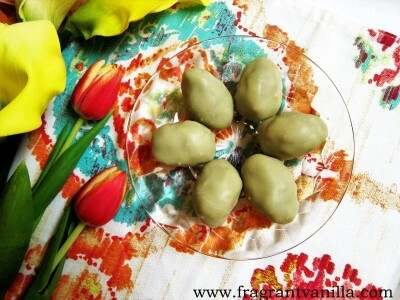 White chocolate with green tea. You don't really taste the hemp seeds, but they contribute to the lovely color. 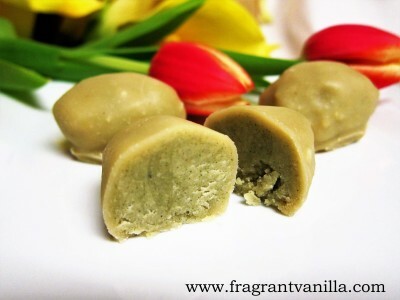 I dipped them in raw white chocolate to complete them. Since I was in more of a vanilla white chocolate sort of mood than a dark chocolate one. Plus they looked more like real eggs, and I loved the contrast of the off white chocolate shell on the pale green filling. They tasted sweet and wonderful as well, you would never know they were made from healthier ingredients! Definitely something wonderful to fill your Easter baskets with! Whisk together all filling ingredients until smooth, then place in the freezer to firm up (but not until it is hard), about 15 minutes (whisk every 5). 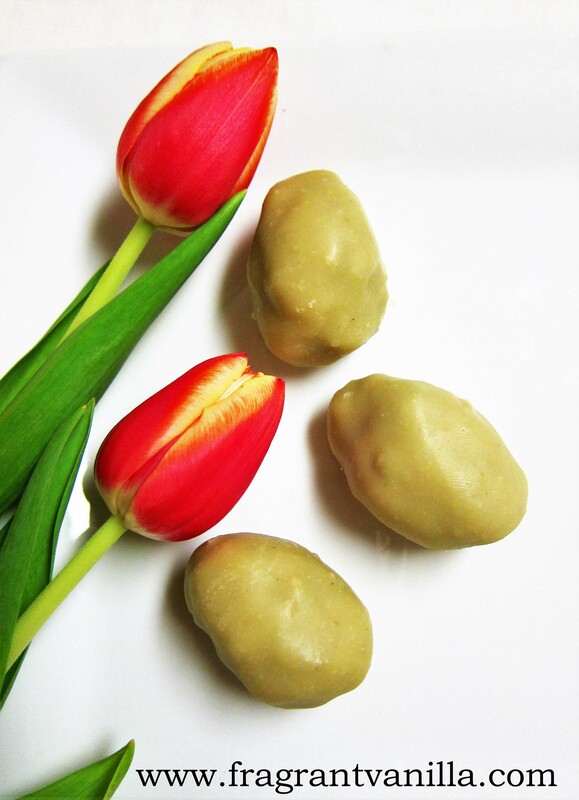 Once it is the consistency of play dough, form into little egg shapes (it is ok if it sticks to your hands a little, but if it is too warm, put it back in the freezer). Place the eggs on a foil lined tray, and place back in the freezer for about 15 minutes to chill. Meanwhile, whisk all of the white chocolate ingredients together in a bowl. Set the bowl next to the eggs, and dip each into the white chocolate letting the excess drain off, and placing back on the tray (I like to set them on a fork for dipping). Once they are all dipped, place back in the freezer for 5 minutes to harden, then dip them again, and repeat. Store in the refrigerator in a sealed container for up to a month. *You can buy raw hemp seed butter, or if you have a high speed blender, make it like I did. To do so, place about 3 1/2 cups shelled hemp seeds into your blender and blend until smooth, using the tamper to press them down into the blades (do not try this with a regular blender, it will not work). Store in the refrigerator.